The ballot has not yet been created for the town elections on March 12, 2019. When it is, we will post the sample here. We will also be posting instructions on how to get an absentee ballot in case you will be out of town that day and can’t vote. Otherwise, voting in person happens at the Bedford High School from 7:00 AM to 7:00 PM. Make sure you are registered to vote! 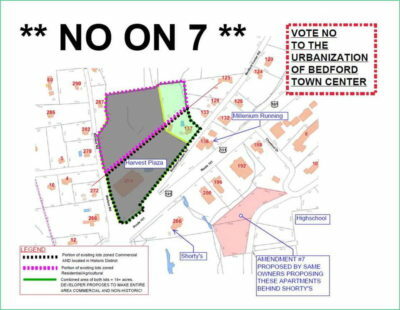 – Vote YES on items #2, #3, #4, #5, and #6 to help PRESERVE BEDFORD. – Vote NO on items #1 and #7 to help PRESERVE BEDFORD.